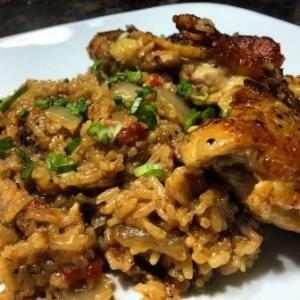 Arroz con Pollo (Mexican Chicken n’ Rice) | Just Cuc It! I had a lunch fail today :/ . . . craving sushi and opted for some kani and seaweed salad from the Chevron cafeteria . . . yeah, next time I need to just work through that craving until I get to some real sushi! By the time the metro got me to my car, I was starvin’ like marvin and ready to stop at the jack n the box!!! But . . . I waited. Good thing I did! I knew I had a tray of chicken thighs almost defrosted in the fridge and my brain went in 50 directions of how to make haste and CUC this up so it could get in my belly! I have a yummilicious recipe for jalapeno chicken that these thighs would’ve been perfect except the jalapenos were a no show in the fridge. After the great Thanksgiving feast and this past Sunday’s block party, my pantry has been a treasure cove of goodies! 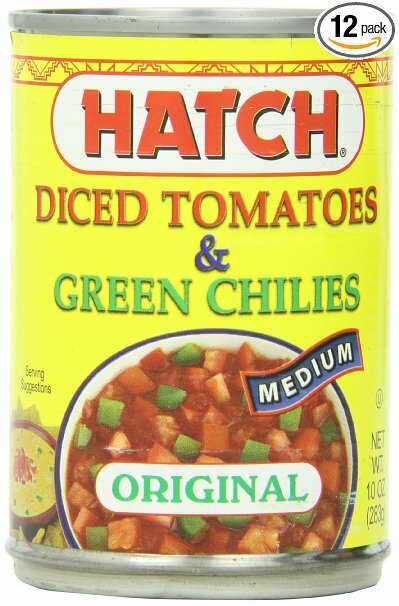 I spied a can of hatch chiles and tomatoes! Arroz con Pollo it is!!!! Thank goodness this recipe is quick and one-pan easy! I didn’t buy ANYTHING this time! Nada! But you may need to gather these ingredients! 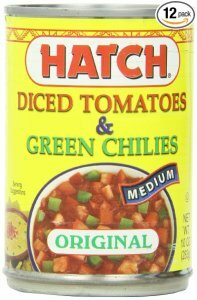 Rotel (tomatoes and green chile) – I used the hatch chiles and tomatoes I found in my pantry; if you like heat, go for it! The trick is to make sure you use boneless chicken. 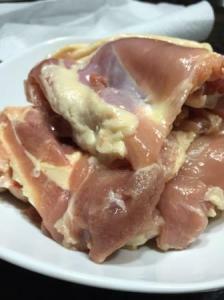 Meat takes longer to cook with bones. I kept the skin on my thighs because I love it! This is personal preference, but you don’t know what you’re missing! In a large skillet, prep the rice by throwing it in the pan to sauté with half of the minced garlic and a little bit of olive oil. If you are using jasmine rice, wash the rice until the water runs pretty clear (to remove the starchiness), drain the water and add to pan carefully – when water and oil mix, there will definitely be splatter! Move the rice around in the pan; you’re looking for the grains to start turning opaque white. Remove the rice and set aside. In the same pan, add another tsp of olive oil and remainder of the minced garlic. Heat should be high. Add chicken, skin side down. 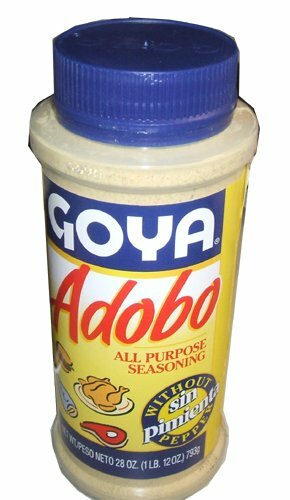 Sprinkle the Adobo seasoning, smoked paprika, onion powder, garlic powder and white pepper on the chicken. Check the chicken to make sure it is browning, but not blackened. Turn over once the other side looks crisp and browned. Sprinkle the seasonings on this side as well. Let brown for another 1-2 minutes. Check your chicken to make sure it is cooked; add the rice to the same pan. Add another cup of water. * If there is still liquid in the pan, start with ½ cup of water, then add more if your rice needs more. The can of tomatoes will have liquid as well, so consider that in your measurements. *I’m really sorry, I never measure when I cook my rice, but I KNOW that the recommended measurements never yield the consistency that I like. It is better to start off slow and add more if you need. Add the can of tomatoes and chiles and the chopped onion. Add the bay leaves and the cumin. Let the pan come back to a boil then turn the heat down to low and cover. Check on the rice every few minutes and turn and add more water if needed. The rice component in this dish usually has more of a risotto feel. But if you like your rice to be al dente, cook it with less water. Should take about 10 minutes to finish. Garnish with some green onion or cilantro if you have it! This meal took less than 30 minutes to prepare. Luckily, my stomach did not give in to Jack in the Box, because this was muy delicioso! Yeah, we ate dinner before 6PM like the Seniors do it! 😛 Enjoy!